President Obama’s engagement with Cuba was one of his administration’s success stories. The policy shift was based on the entirely realistic as well as humanitarian assessment that permanent estrangement deepens enmity, isolates two peoples and separates families, reduces opportunities for improvement in the quality of life in Cuba, inhibits the two-way flow of information, and prevents cooperation on common problems. But the Trump administration, pressed by Senators Marco Rubio and Robert Menendez, is still fighting the Cold War, as evidenced by Trump’s disengagement order this week. Let’s recall how Obama, in defiance of right-wing critics, reinforced his policy direction and personal visit to Cuba by issuing a legally binding order—Presidential Policy Directive 43—on October 14, 2016, just months before leaving office (www.nytimes.com/interactive/2016/10/14/world/americas/document-Presidential-Policy-Directive-on-Cuba.html). PPD-43 makes the case for normalization of relations with Cuba, recites the extensive diplomatic exchanges that have occurred, outlines cooperation in areas of mutual interest, and expresses the hope of improvement in Cuba’s human rights, economy, and regional integration—all while reassuring Cuba that regime change is not US policy. Department by department, the document recites the numerous collaborative ventures ongoing and possible, such as on public health, food security, private investment, environment and ecology protection, immigration, travel, counter-narcotics, and joint scientific projects. One specific step taken by the administration at this time was to remove the ceiling on imports of Cuban rum and cigars. But the one thing Obama could not do was end the embargo, where right-wing members of Congress have always had their best chance to limit engagement. Obama left Donald Trump with a substantial list of new interactions with Cuba, some of them—such as money transfers to Cuba, and a major increase in tourism—designed to support small businesses and civil society. Obama also left Trump with some unresolved issues with Cuba, such as a sharp increase in Cuban immigration to the United States (in part thanks to the upward pressure on prices due to US tourism), regulatory blockages, and the slow pace of Cuban economic reform (Michael J. Bustamante, “Obama’s Move on Cuba,” in Gideon Rose, ed., Cuba Libre? 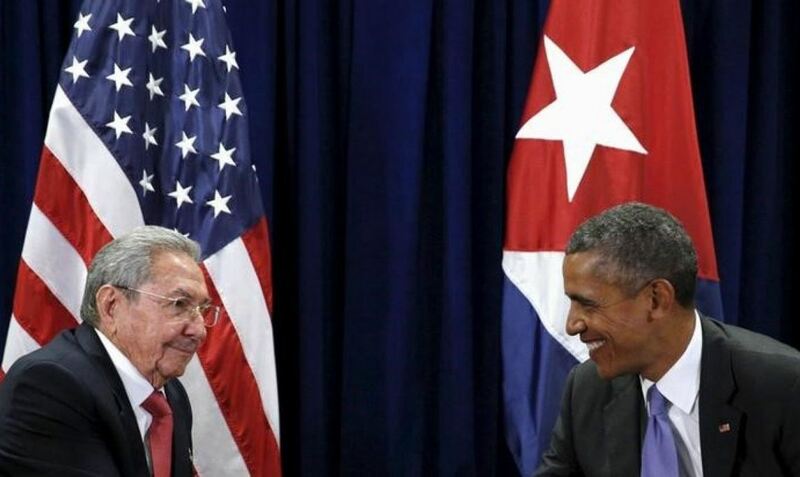 U.S.-Cuban Relations from Revolution to Rapprochement). Such problems normally would be resolved over time. Under Trump, however, progress made with Cuba was bound to be set back, just as it was with Iran. Fidel Castro’s death prior to Trump’s inauguration ordinarily might have been a time for a sympathetic note to Havana and an opportunity to deepen the accords already reached. Instead, Trump tweeted: “If Cuba is unwilling to make a better deal for the Cuban people, the Cuban/American people and the U.S. as a whole, I will terminate deal.” The implication was that the US would demand changes in Cuba’s human rights and political system in return for continued engagement and a softening of the embargo. Trump’s partial reversal of Obama’s engagement with Cuba in June 2017—partial because diplomatic relations and most types of tourism remain in place—is more likely to undermine than promote the slow improvements in Cuban civil society that engagement has produced. Independent journalism and private entrepreneurship are reemerging there. Trump’s limits on general US tourism greatly reduce interactions between ordinary citizens of the two countries, and restrictions on how US dollars may be spent undercuts small Cuban businesses. (Surely coincidental is that new American hotels that might compete with future Trump hotels are prohibited from opening in Cuba.) Maintaining the US embargo is also highly unlikely to ease Cuban restrictions on human rights, and making the latter a condition for easing the former is sure to arouse official Cuban anger. As one expert in US-Cuba relations (William LeoGrande) observed, negotiating economic and travel arrangements is one thing, sovereignty is another. Cuba’s memory of US interference is long, and Cuba will not countenance another such era (“What Trump Misses About Cuba,” New York Times, December 1, 2016). The Trump administration’s abandonment of full-fledged engagement with Cuba leaves untouched reassessments of policy toward other, and far more destructive, authoritarian regimes, including the Saudi monarchy, Putin and the Russian oligarchy, al-Sisi’s military regime in Egypt, and Duterte and his henchmen in the Philippines. Once again, a US leader has chosen to ride the wrong horses.